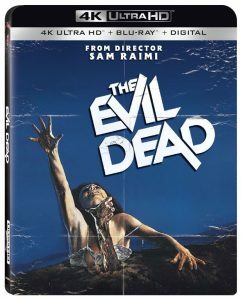 The Evil Dead 4K release will feature a familiar and classic cover design; we’re happy with that! The original artwork is awesome, so we see no need for anything else. It’s chilling and wonderfully shines a light on the film’s literally gripping storyline. The Evil Dead exploded on to screens in 1981, propelling Bruce Campbell into cult stardom in the role of Ash Williams who, until recently, was still portraying the axe-wielding demon-battling hero in Ash vs Evil Dead. The Evil Dead follows a group of young folk who unwittingly unleash a demonic entity when reading from the skin-bound Necronomicon. The film has since spawned two – much funnier, but equally entertaining sequels, as well as remake from Don’t Breathe director Fede Alvarez in 2013. Be sure to get your hands on Evil Dead in 4K this October 9th.